Inspired by Moroccan decor details and henna patterns, Vanessa crafts a myriad of candle holders, vessels and lanterns for the home. All of her creations, found in her LIT Decor Etsy shop, are perfect additions for a porch or favorite windowsill and can be hardwired for indoors too. 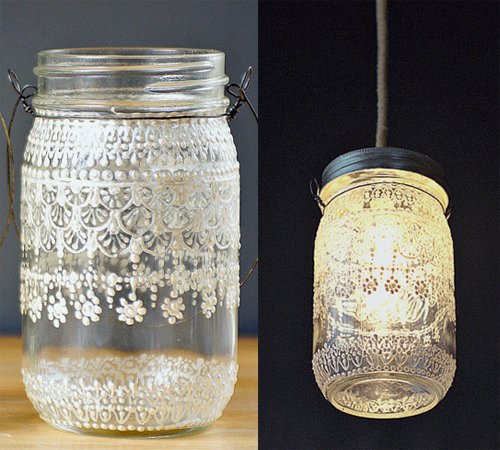 Every lantern is made from upcycled jars and every design, done by hand, is one of a kind. They are also hand washable and able to withstand the wind and rain. I especially like her hand painted vases and the playful, pretty creations listed under the category, New Designs. Vanessa's shop actually has well over 200 items to choose from so it's worth checking out. Can't hurt to add one more mason jar to the collection, right?